Majority of the accessories are carried over from the standard TUV 300. 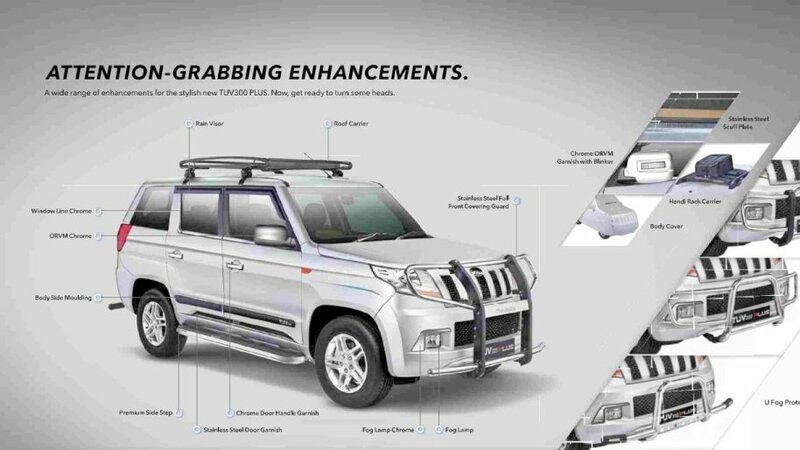 Post the launch of the TUV 300 Plus, Mahindra has now released the Accessories brochure of the TUV 300 Plus. The list of accessories includes some carried over parts from the regular TUV 300 and some new additions. The accessories include regular offerings like DRLs, chrome fog lamp garnish, front guard, aluminium side steps, roof carrier, chrome ORVM garnish with turn indicators, stainless steel scuff plates, 16-inch alloy wheels, 16-inch wheel covers, chrome door handle garnish, logo projectors and sporty pedals apart from some variant specific additions. For example, front fog lamps and reverse parking camera are available only in the P8 variant, but P4 and P6 variant customers can get a reverse camera with a dedicated screen or an IRVM mounted screen as an optional accessory. Tyre Pressure Monitoring System is not offered as a part of the standard vehicle, across the range, however, one can install it as an optional accessory. 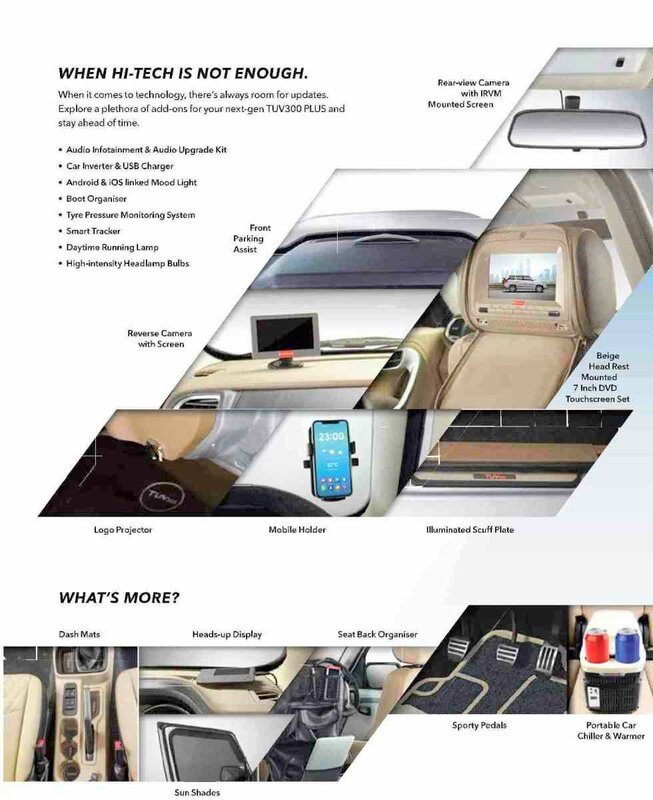 Similarly, one can install a car chiller and warmer, a rear seat DVD entertainment system with 7-inch display, car inverter and USB charger etc. for additional creature comforts. The TUV300 Plus shares its 2.2 litre m-Hawk engine with the Mahindra Scorpio. The larger engine helps it to take care of the additional weight which it possess due to the elongated body and the additional seating capacity (capable to seat 9, instead of 7 on the regular TUV 300). The 120 hp producing motor is mated to a 6 speed manual gearbox, instead of the 5 speed unit which comes as standard in the regular TUV300. The TUV 300 Plus is available in 3 variants: P4, P6 and P8 and comes in 5 colour options. Pricing starts at INR 9.47 lakhs and goes up to INR 10.86 lakhs for the top-end variant.